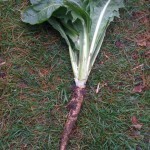 Belgian endive grown as a root crop. Imagine a care free-crop you can grow all summer,pick in the fall and store in a closet for winter harvests of fresh,crunchy salads. 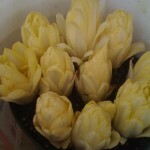 It’s not a dream but a Belgian endive! I’ve just started harvesting my 2010 crop this month. It all started back in June when the endive was planted along with my storage carrots around the summer solstice. Over the warm months the plants grew dark green,lettuce-like leaves and deep,vigorous tap roots. There’s no temptation to harvest the leaves at this stage as they taste impossibly bitter. In mid to late fall,I dug up the plants along with other roots destined for the root cellar. 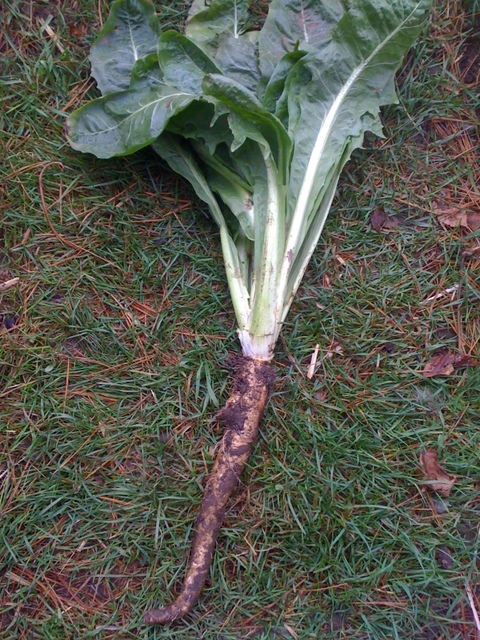 The endive leaves were cut off,leaving a stump about an inch high above the root,and the roots trimmed to leave about 6 inches of the fattest part. 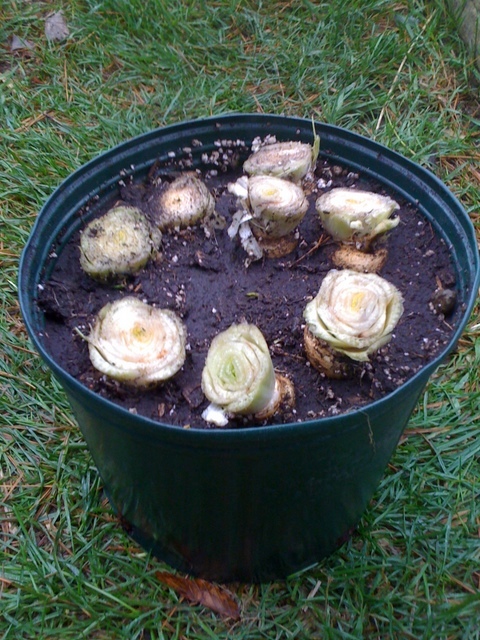 Pruned and potted endive roots,ready for forcing. For my compact,house-friendly,no-mess forcing system I use a 5 gallon bucket to contain any moisture,and replant the endive roots upright in a 3-4 gallon plastic nursery pot with used potting soil,packing the roots closely together. The pot is watered thoroughly and after it drains,placed into the bucket and covered loosely with several layers of newspaper,or an overturned cardboard box and the bucket cover. The point is to keep light out but to let air circulate. Then comes the hard part. You need to find a consistently dark place with a temperature that stays around 50 degrees F. Too warm and the resulting leaves will be fuzzy and lack crunch. Too cold and the roots will refuse to sprout. Any light penetration onto the leaves will turn them green and render them inedible. I use a closet on the north wall of the house in our guest bedroom that is kept cool when not in use. I keep my fingers crossed that no one will visit for an extended stay and over-heat the room during the period the endive shoots or “chicones”are growing! 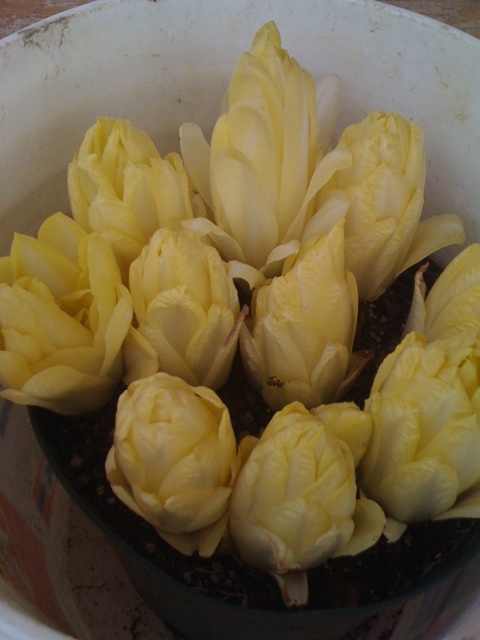 Commercial growers of Belgian endive tightly pack the roots in boxes of sand and grow them in a dark,temperature-controlled place. I tried sand my first year but found it too heavy to lug around. Any medium that holds moisture and drains well seems to work just fine. Since potting up the Belgian endive occurs at the same time that I am dumping out the soil from the summer’s potted plants,it makes sense to reuse the spent soil for this purpose. Chicones in February,ready for harvest. 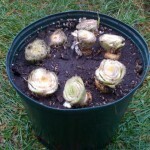 If you want succession crops throughout the winter,you can store the pruned Belgian endive roots in a cold root cellar or in the bottom of a fridge,just as you would other root crops,either in a loosely sealed plastic bag or planted in a dry medium that can be watered and brought to 50 degrees when you’re ready to begin forcing them. I found that one bucket usually suffices especially because most roots will continue to push up multiple small buds after the first cut. And by the time those are done,we are usually harvesting ample greens from the early spring hoop house. French chefs are said to carefully cover Belgian endive in their shopping baskets to prevent any light from greening the leaves on the walk home. That not only illustrates how easily the endive leaves can be ruined by light but also testifies to the aliveness of produce grown at home or from local fresh markets. It’s the slight sweetness from blanching and the hint of bitterness that accompanies the mild flavored,cream colored leaves that make Belgian endive such a prized ingredient in winter. I love simply picking the chicones,rinsing and breaking them apart for perfect little leaf “boats,”crunching them along with other raw vegetables or filling them with tasty dips for appetizers. They also can be cooked as in this pan-braised recipe,transforming the crisp leaves into a smooth, caramelized side dish —delicious but something I rarely make because I can’t stand to use up so many chicones in one recipe. Tonight I made a version of this Belgian endive and mache salad that,accompanied by Eric’s just-baked,crusty bread,made a light but very satisfying supper. It was a special thrill to use mache harvested this afternoon from our hoop house,still-tart Empire apples from a local orchard,and a tangy,smooth Vermont blue cheese,dressed with our home-made apple cider vinegar, maple syrup and a local sunflower oil. Who says you can’t produce wonderful fresh salads in February,even in Zone 4!